Andrew Geller, the "architect of happiness" is celebrated for his iconic beach house but he is less well known as a painter. Yet it was his artistic talents that earned him a mention in the New York Times at age fourteen after he won a competition for adults with his painting "Self Portrait on the Brooklyn Bridge". His painting was displayed at the Brooklyn Museum and he attended art classes there before winning a scholarship to the New York High School of Art and Music. After graduating he took the entrance exam for Cooper Union, claiming that that although he passed all parts it was his skill in free-hand drawing that merited him the place. Andrew Geller continued to draw and paint after college, filling drawing pads with self-portraits and sketches of his artist wife Shirley. During his army service in World War II he was often asked to draw his commanding officers. As his architectural career took off he produced concept sketches brimming with character and gaiety as well as watercolor renderings of prospective projects but there was less time to paint for pleasure. After his retirement from Raymond Loewy International in 1975 he continued to design houses for private clients and it was not until the late 1980s that he was able to devote time to regular painting expeditions around the north shore of Long Island with friends and Shirley. From these excursions he produced a series of watercolor abstract landscapes. 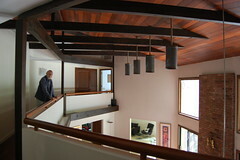 I am very fortunate to have two hanging in the great room of the Cool House. One is a small, predominately bright blue work from 1994, reminiscent of a pond reflecting the clear sky on a sunny day. The other, which hangs on the chimney breast, is larger and dated July 11 1993. 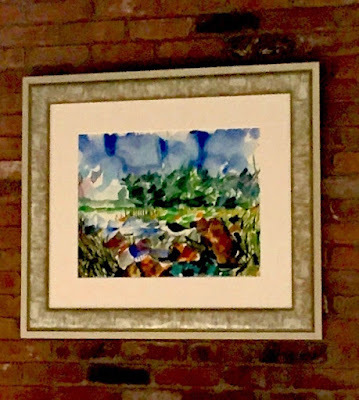 It reminds me of the waters at Caumsett Park in Lloyd Neck or Crab Meadow in Northport, I have to thank Jake and Tracy Gorst for this wonderful painting and Cherie Via Rexer and her team at Ripe Art Gallery for enhancing its character and beauty with this striking frame. Throughout the nineties Andrew Geller experimented with other forms of painting. He embraced pointillism both as pen and ink drawings and in large format acrylics and his work was often exhibited in local galleries. He continued to paint until a few months before his death in December 2011. One of my favorite Geller paintings is also one of his last: an abstracted dancing figure among swirls go red, purple and green, whimsical yet powerful.